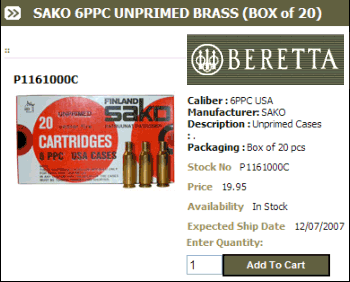 The folks at Beretta USA just notified us that Beretta has quantities of SAKO-brand 6PPC cartridge brass in inventory. This stuff has been hard to find. At $19.95 for 20 pieces (item #P1161000C), Beretta’s SAKO PPC brass is expensive. But there are folks out there who’ve been looking for the stuff, because it gives you PPC cases without fire-forming from 220 Russian Brass, or neck-turning. These cases are correctly sized for SAKO 6PPC USA chambers with no-turn necks. Share the post "SAKO 6PPC USA Brass Available from Beretta"
Interested certified instructors can go to the International Hunter Education Association (IHEA) website for details on the new Savage program. CLICK HERE for the IHEA Special Offers page, then you’ll need to log in using your password. Share the post "Savage Offers Discounts for Hunter Education Instructors"